Everyone has heard of Greece and its magnificent nature. We all know that this country boasts with long sandy beaches, crystal-clear sea, and stunning tourist attractions. However, what many people are not aware of is the fact that there are many regions in Greece and therefore browsing for broad terms such as “Best beaches in Greece” is unlikely to provide useful information. In one of my next posts, I plan to pay more attention to the different Greek regions and the types of vacations they offer. Here, on the other hand, I plan to focus on the best beaches in Greece mainland. As you may know, Crete, Santorini, and Mykonos are popular tourist hubs; nonetheless, these are islands and their beaches are not relevant to those traveling to the mainland of Greece. Spots that are found on the mainland include Chalkidiki and its three fingers Kassandra, Sithonia and Athos, the Pelion Peninsula, the Peloponnese and the region from Syvota to Parga. Often overlooked, these have lots of hidden paradise locations where travelers can enjoy nature, blue sea, and sandy beaches. Without further ado, let me present my favorite beaches in northern Greece mainland, chosen from the ones I have visited so far. I must warn you, most of them are in the Chalkidiki, Pieri, and Pelion regions. Papa Nero is a wonderful place to relax and enjoy your summer thanks to its crystal waters and position. The beach is nearby the popular tourist town of Agios Ioannis in Greece mainland and attracts many tourists visiting the Pelion region. However, Papa Nero is wide and long enough to accommodate everyone and, at the same time, allow visitors to have personal space. Some parts have bars for those that prefer sunbeds and umbrellas, but there are also parts for those that simply want to relax on the sand. Somewhere between Sithonia and Athos, Assa Maris Bomo Club hosts one of the most impressive beaches I’ve ever seen. This all-inclusive beachfront resort boasts with a golden sandy beach, which is wide and long and clean and simply wonderful. Moreover, the sunbeds and the umbrellas are offered to guests for free, just like the drinks you can take from the pool bar. Therefore, anyone looking for a truly relaxing experience should have this resort on their bucket list. Back in July, I was in Chaniotis; even though I like the town beach over there, it was pretty crowded as the summer season has already started. Therefore, I wanted to explore Kassandra and discover more of the Greece mainland to find a more intimate spot on a beach, but as equally wonderful as Chaniotis’ beach. 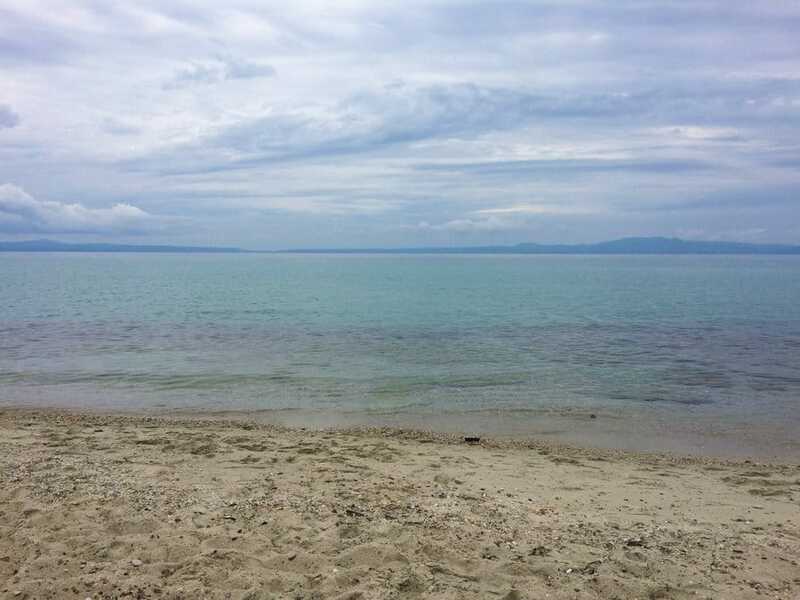 Our heaven during the holiday turned out to be Glarokavos Beach. Namely, if you Google Glarokavos Beach you will find some unreal photos of the Glarokavos Marina; these look amazing, but in real life, the marina is just a small bay filled with boats during the summer season. Expectations versus reality can definitely be a mood killer as the images of the Glarokavos beach were so hipped up, when in reality it just turned out to be a small bay. 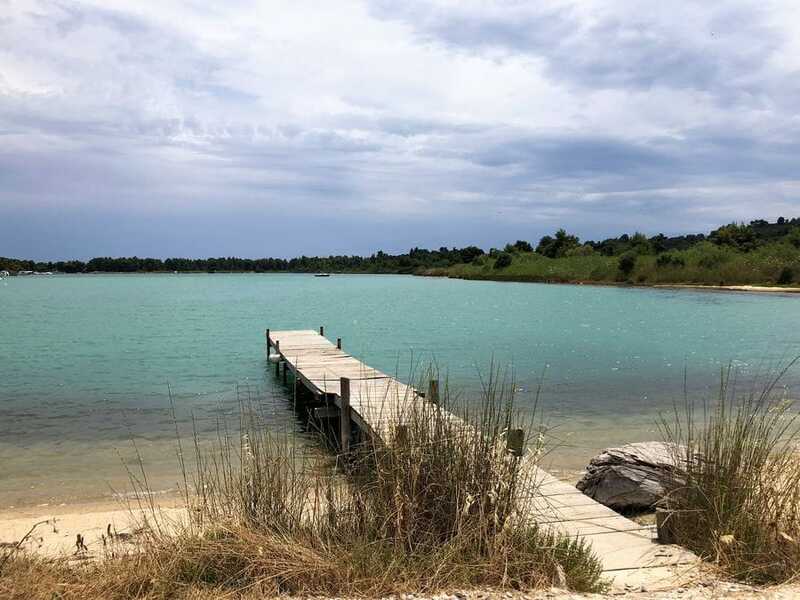 However, the water on the other side of the marina – the open sea – is crystal clear and has lots of fish; this makes it perfect for those that want to snorkel, shoot underwater videos and take relaxing swims. The beach is sandy, there are several bars and even a balloon action park. 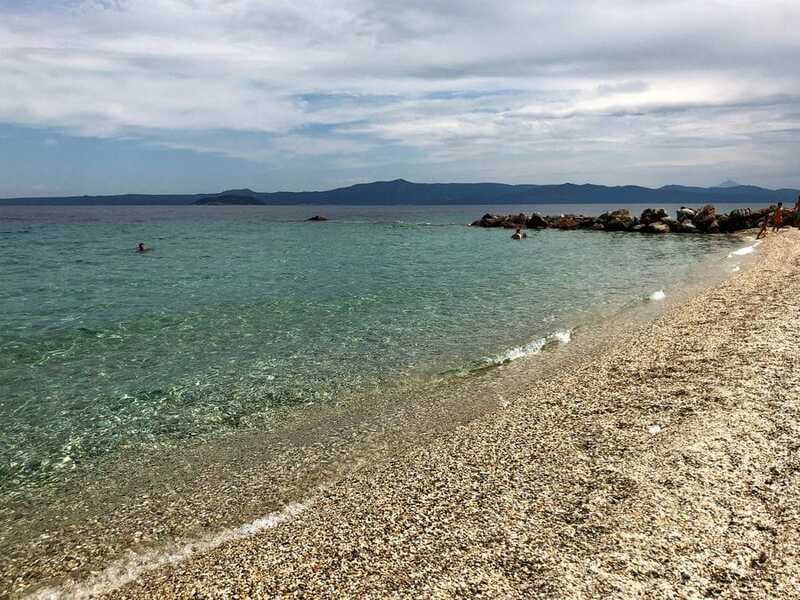 Well, to be honest, this is far from the best beach in Greece mainland; however, it is near Kallikratia and I believe it’s a good option for those staying in that region, which cannot boast with too many nice beaches. I was going to Mykoniatika Beach when I stayed at Hotel Paraktio the first time. The beach was nice, there are many bars where you can eat, drink and enjoy the music. Moreover, if you are willing to explore the area around the rocks you can find your own personal piece of heaven hidden from the crowds. Oh well, I’ve mentioned this amazing spot more than once in my blog posts. The reason is simple – it is worth it! Portokali Beach or Orange Beach used to be a secret heaven for many years as not many tourists knew about it. Nevertheless, the modern era placed it on the map and now it is an organized beach with a bar. Truth be told, Portokali Beach is not that large and finding a spot during high season is a real challenge. Nonetheless, when you see the amazing rock formations surrounding the beach and the light blue sea, you’ll not feel sorry for deciding to give it a try. There’s even a huge rock in the sea in the shape of an elephant several hundred feet out of the coast of Portokali beach that’s a popular attraction to visitors. Neighboring Portokali Beach, Karydi is another widely recognized beach in Greek mainland. Even though you need to drive to get there as it’s away from everything and then walk a bit in order to get to the beach, Karydi is a paradise you want to experience. This beach has two parts – one is large, shallow and perfect for kids. The other is rocky, exciting and perfect for snorkeling. I must warn you, however, Karydi, just like Portokali, gets super crowded during high season; thus, be prepared for sharing the place with lots of other people exploring the Greek mainland for the perfect beaches. Far on the other side of Kassandra, there is another magical place to visit. 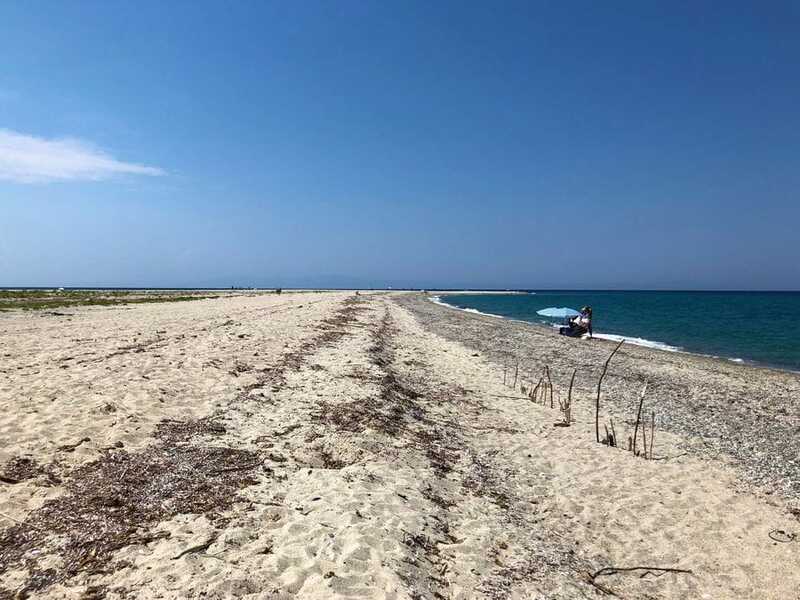 The Possidi Cape, also known as Poseidon’s Cape, is not a small beach, rather a huge sandy area where those looking for an adventure can go to enjoy the sea. Depending on the sea level, the exact shape of the Cape changes and this makes it even more attractive. Things to note, however, include the fact there are no bars at the Cape, no shops, and no showers. So, if you go there make sure you’re well prepared. Plus, there’s a long walk on the sand until you get to the end point of the Cape. 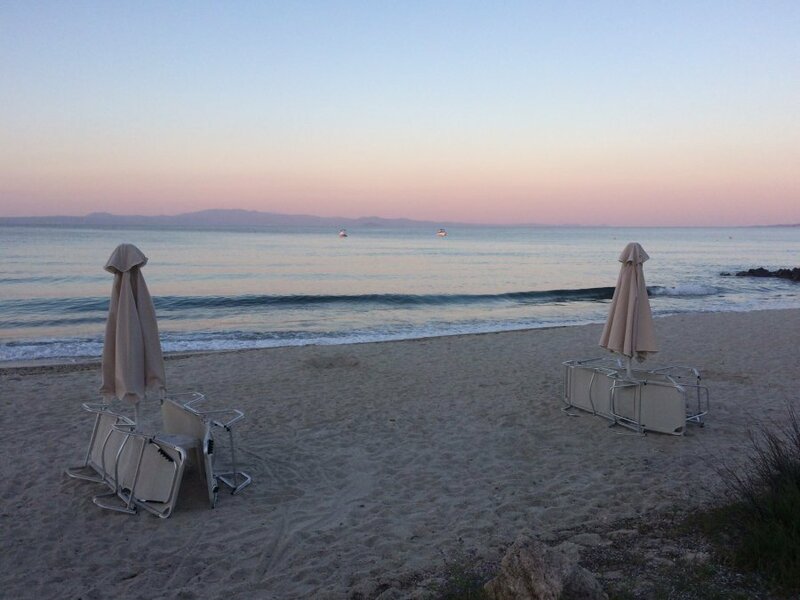 Another magical place to have in mind when searching for the best beaches in mainland Greece is Pallini Beach in front of the Pallini Beach Hotel. Open to both resort guests and outside visitors, this beach has soft and smooth sand to soothe your feet. The water is clear and shallow, perfect for summer leisure. Well, I really hope you enjoyed this list of 8 top sandy beaches in Greece mainland. I must point out that this list is far from complete as the magical Greek mainland hides many more such magnificent spots. 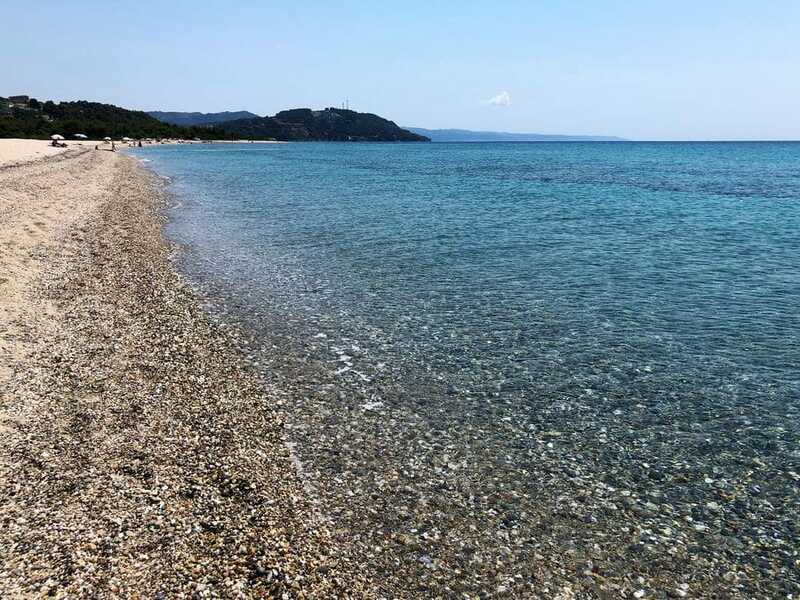 Nevertheless, if you find yourself in the Chalkidiki, Pieria, or Pelion region, I hope that I made your search for a beach to visit a little bit shorter with my suggestions.